I wanted to create and share a resource page for other food bloggers to see which products and services I use on OMGFOOD. I’ll most likely update this page as I find more resources I think will be helpful. Disclaimer: This page contains some affiliate links, which means I will make a small commission if you purchase through them. I use all of the products and services listed below and only recommend them because I personally have found them helpful. If you have any questions regarding any of these, please let me know! Nikon D3200 – This is my first-ever DSLR and it’s great for entry-level photography. I purchased it when I first launched OMGFOOD in February 2014 without knowing a single thing about taking good photos. I’ve learned a bit since then and still have a lot more to go! I see myself using this for a long time before upgrading to a much more expensive full-frame sensor camera. Nikon 35mm f/1.8G – For about a year, I used the 18-55mm f/3.5-5.6 lens that came with my camera, but I wanted to purchase a prime lens for better food photos. I went with a 35mm because I use a crop sensor camera (you can learn more about that here) and from what I’ve learned through other food bloggers and photographers who use a similar camera type, a 35mm can be the way to go to achieve a look that’s close to 50mm, which is close to what the human eye would see. I love the depth of field I’ve been able to achieve using this lens. I would like to upgrade to a nice macro lens eventually, but that’s not in my budget just yet. Davis & Sanford 60″ Tripod – For a starter tripod, this does the job and is inexpensive (I paid around $20). If you don’t mind spending a couple hundred bucks, you can get a tripod that’s more involved, with arms that can extend out, so you can take top-down shots. This tripod doesn’t do that, but if you’re just starting out, you don’t need anything extravagant. It’s lightweight and can be stored away easily. Nikon Remote Release Cord – This shutter release is handy for a couple of reasons. Maybe you want to take an action photo, but can’t really pour liquid or hold up a utensil because you also have to take the photo! Having to deal with taking an action photo while having to press the shutter button on the camera can be tricky and annoying. This remote comes in handy for situations like that because you can have your camera set on the tripod and take your photos using the remote, letting you be closer to the food and have better control of the action shot. Another important reason to have this is because pressing the shutter button on the camera itself will cause camera shake/vibration, which results in blurry photos if you’re shooting with a longer shutter speed. This remote will greatly reduce the vibration/photo blur. Tasty Food Photography eBook – I’m still very much a beginner when it comes to food photography and when I first started blogging, I basically went in blind on taking photos. If you look at my posts back from when I first launched the blog, it shows! I recently discovered this ebook from Lindsay over at Pinch of Yum. She wrote this book to help noob food bloggers like me become better at taking food photos. This book will teach you so much; I highly recommend purchasing it. 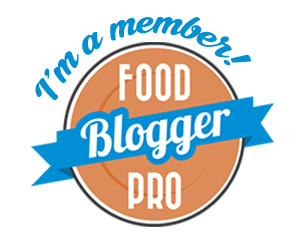 Food Blogger Pro – This is absolutely my favorite and most helpful resource. Created by Lindsay and Bjork over at Pinch of Yum, FBP is about learning how to start and grow your food blog. They have a rad video section with step by step instructions to teach you all of the things from simply knowing how to use WordPress to using your DSLR, editing photography, monetizing your blog, plus a bunch more. There is also a community forum with 900+ bloggers who are super supportive of each other. I’ve learned so much from FBP and continue to learn more each day. It’s an amazing resource that’s worth your time. You can choose between a monthly membership or yearly. Namecheap – I use Namecheap for my hosting service. It’s affordable, you pay yearly, and the customer service has been pretty great. I recommend it for bloggers just starting out. 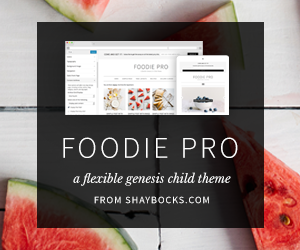 Foodie Pro Theme by Shay Bocks – This is the theme I used to use for OMGfood before changing it to Brunch Pro (also by Shay Bocks). It’s a child theme of the Genesis Framework and I purchased both on StudioPress. 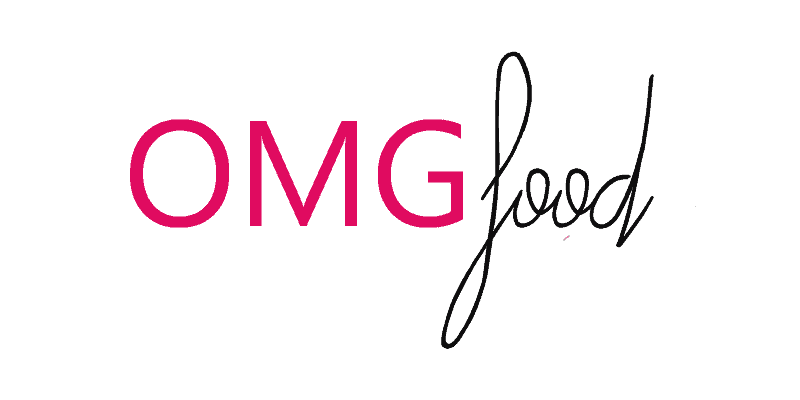 Genesis is popularly used by many bloggers in general and Foodie Pro is a big hit among food bloggers. It’s streamlined, has a beautiful and clean look, is easy to navigate, and best of all, it has a recipe page built-in. It’s also mobile and tablet responsive. I love this theme. MailChimp – This is the email marketing app I use to send out blog posts and updates via email. It’s really easy to use, they have awesome customer support if you ever need it, and the best part is they have a free membership option! They also hate spam as much as you and I do, so you never have to worry about that. Akismet – Protects your blog from comment spam and trackbacks and let me tell you, it’s absolutely worth it. Broken Link Checker – Sometimes a link will end up being broken because you either deleted it or if you linked from another source, they deleted it or changed it. This plugin will alert you so you can fix it. No one loves to click on a bad link. Easy Recipe – This is the recipe plugin I use for OMGfood. I paid $25 for the plus version, but that doesn’t mean you have to. They have a free version, too! Google Analytics by Yoast – This plugin allows you to simply add Google Analytics to your site. Simple Share Buttons Adder – There are lots of plugins for adding share buttons to your blog to allow you and your readers to share posts to social media, but this one is especially great because it has a “Yum” button for Yummly, which you want as a food blogger (more info on this in the “Driving Traffic to Your Food Blog” section below). I also like that you can customize how the share buttons are displayed. Wordfence Security – This is an excellent security plugin that’s totally free. You can opt for the premium version for even more security and two step authentication when logging into WordPress. WordPress SEO by Yoast – SEO is a bit of a beast. This plugin does the hard work for you. Yummly for Publishers – Yummly is an awesome and humongous recipe database. You can save recipes from a bunch of your favorite blogs in your recipe box and you can search for recipes by ingredient, allergy, diet type, time, etc. While it’s a great app for someone looking for recipes, it’s also great for you, the blogger, because having your recipes published on yummly means more people coming to your blog. They will see a photo of your recipe, a list of ingredients, and a link to direct them to your blog for the full recipe. This is why the Simple Share Buttons Adder plugin is a necessary one because it’s the most highly rated plugin with a “Yum” button. Within a month of signing up for this, my page view count doubled. Shrimp scampi is currently OMGfood’s most popular recipe on Yummly. Foodgawker and Tastespotting – These are two food photo submission sites I use. They can be a little strict on what photos they accept to be posted, but don’t feel discouraged! Practice makes perfect and all that, right? It might take a bit before your submission is accepted, but once it is, the traffic you gain from it will be awesome! Pinterest – I’ve heard other bloggers say Pinterest drives the most traffic to their blogs. I’m not there just yet, but I recently joined group boards with other bloggers to pin my content to and re-pin stuff from there to my own boards (it’s give and take, guys!) and I’m beginning to notice an increase in traffic coming from Pinterest.